GLOBAL ECONOMIC CRISIS or no, 2009 was a breakthrough year for Sunsuria Sdn Bhd. That’s when it launched The Core in Kota Damansara, a joint venture development with landowner the Selangor State Development Corporation (PKNS). The development, situated in a high-end industrial park, won The Edge-PEPS Value Creation Excellence Award 2014 in the Non-Residential category. Kota Damansara was already a mature neighbourhood in 2009, but it needed a commercial development such as The Core, says Sunsuria executive chairman Datuk Ter Leong Yap. The Core is a self-contained meeting place for both business and leisure, he adds. According to Ter, the business is built on integrity and reliability. “We know that for most people, buying a property is a lifelong commitment using life savings, which places huge responsibility on property developers to offer something of lasting investment value,” he explains. Ter founded the Sunsuria Group in 1989, when it began developing residential, commercial and industrial projects in the Klang Valley. It now boasts a track record of innovative, high-value projects. The Core is an acronym for “Contemporary Office Retail Entertainment Centre”. 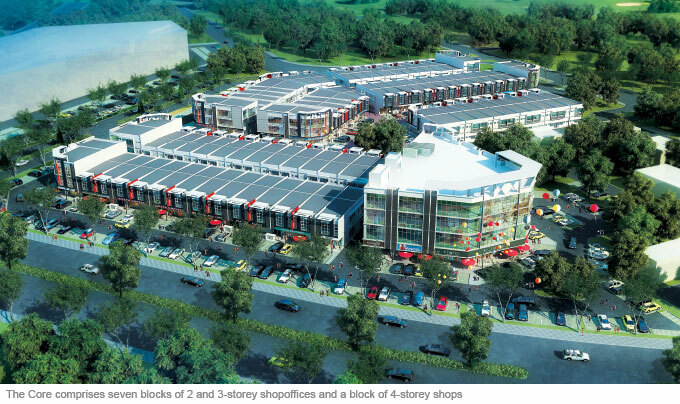 It comprises seven blocks of 2 and 3-storey shopoffices and a block of 4-storey shops. It sits on 10 acres and has a gross development value of RM142.6 million. It was completed in December 2012. The award is based, among others, on the value of five first floor units of the 2-storey shopoffices, which have built-ups of between 720 and 850 sq ft. The five units were sold by Sunsuria for between RM182,000 and RM221,340 in 2010. In 2013, these units were transacted on the secondary market at between RM300,000 and RM450,000. This represents an average appreciation rate of 84% over four years. The average appreciation rate per annum is 21%. The burgeoning Kota Damansara area is accessible via multiple points, including the New Klang Valley Expressway, Damansara-Puchong Expressway, Penchala Link, Middle Ring Road 2 and the Guthrie Corridor Expressway. It is linked to numerous residential areas and is in close proximity to many malls such as 1Utama, The Curve, Ikano Power Centre, Giant Hypermarket, AEON Big, Tesco, and Sunway Giza. It is also close to The Strand, Tropicana Medical Centre, Seri Selangor Golf Course, Tropicana Golf & Country Resort and educational institutions such as Sri KDU Smart Schools and SEGi University. Connectivity is of utmost importance to success, says Ter, because it catalyses the appearance of vibrant and, eventually, mature communities in the area. Sunsuria could have sold The Core with a higher plot ratio, but instead decided to “optimise” this figure. The current plot ratio, according to Ter, ensures the availability of adequate parking lots, which makes the place more conducive for business. A high plot ratio would also have led to more unoccupied lots and reduced the commercial sustainability of the development, he says. The Core has a contemporary faÇade design as reflected in the choice of lively colours by the developer, while its interior allows for future expansion. Feedback from customers showed preference for a larger entrance and a space unobstructed by columns. “These little things contributed to a higher take-up rate compared with our competitors,” Ter says. The developer also decided to split the first floors of the 2-storey units into front and back offices, making the units easier to rent out. The rent per annum of the front and back offices is RM16,800 and RM15,000 respectively, while the average rental yield per annum is 7.9% based on the original selling prices. The 244-unit development has had an occupancy of 70% since January 2013. The remaining 30% are not tenanted due to owners being selective about the type of tenants or asking for high rents and some of them keeping the units for their own use. Apart from The Core’s location, concept and price, the developer attributes its success to its property leasing and management services, which include building management and a concierge. Leasing services are offered to owners with no service fee. The developer’s familiarity with the area allows it to market the property, control rental rates and ensure the right tenant mix. 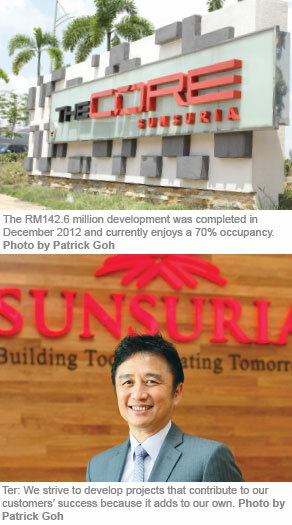 Ter believes this has led to repeat purchasers who are loyal supporters of Sunsuria projects. Ter observes that Kota Damansara is almost 90% completed with the exception of some brownfield land. Kota Damansara, also known as Petaling Jaya Utara, can be considered a new area of Petaling Jaya. The commercial areas there do well and are alternatives to places like SS2, he reckons. The Sungai Buloh-Kajang mass rapid transit line is expected to have a provisional station located adjacent to The Core, adding to its value. The line is expected to be completed by end-2015 or 2016. Ter foresees more commercial projects in the area and an appreciation in property values as Kota Damansara continues to mature. He remains optimistic the area will prosper over time. Sunsuria has another development in Kota Damansara, namely Sunsuria Avenue, which is a 7.25-acre commercial hub comprising an 8-storey commercial tower, a boutique hotel, and a sports and recreational complex. It is also the location for Sunsuria’s corporate office and main sales gallery. The company is considering adding a residential component to the development to cater for the growing segment of buyers who prefer to live, work and play at one address. Some of Sunsuria’s past developments include Sunsuria Seventh Avenue in Setia Alam, and Suria Jelutong and TRIVO in Bukit Jelutong. The developer’s current developments are Suria Hills in Setia Alam, Suria Residence in Bukit Jelutong and The IONS in Sunsuria Medini. After Kota Damansara, where next for Sunsuria? “You will see significant improvements when we roll out our next projects ­— Xiamen University Malaysia Township in Salak Tinggi and The Forum, another people-meeting place that we are going to develop in the growing Setia Alam township,” says Ter.